NickLannon.com: Can You Boo a Player to Greatness? 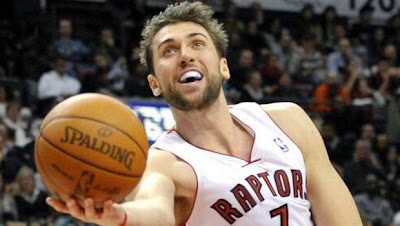 The Toronto Raptors' Andrea Bargnani, the number 1 overall pick in the 2006 NBA Draft, is having a terrible season. So terrible, in fact, that he's being loudly booed by his home fans. Check out this quote from Zach Lowe of Grantland.com: "Bargnani has been obscenely horrible on both ends since his return from injury, to the point that [head coach] Dwane Casey is sneaking him into home games after timeouts so that fans don't have a chance to boo the Italian big man at the scorer's table." Bargnani's case is certainly not unique; under-performing players are often booed at home. What's most interesting, though, is a question: does the strategy work? In theory, home fans boo their own players to shame them into working harder. Some, of course, might be expressing simple hatred, but I think that most fans would prefer that their players actually play well. So let's take a quick look at Bargnani's stats: He's shooting 47% from the field on the road (which is pretty bad for a man of Bargnani's size, though he is a perimeter player)...and an absolutely horrific 30% at home. Thirty percent! Obscenely horrible indeed. St. Paul said that "the law was brought in so that the trespass might increase" (Romans 5:20). There can be no clearer evidence than Andrea Bargnani. He's playing terribly. Subjected to the law, the chorus of boos that tells him he's not good enough, Bargnani is significantly worse. The law comes in; the trespass increases. The more Bargnani is reminded of how terrible he is, the more terrible he becomes. The same is true of every one of us. Christians have an outlet that Bargnani lacks: when we hit bottom, we have a savior there to pick up the pieces. A Christ who substitutes his perfection for our failure. The more shots Bargnani misses, the more likely he is to be out of a job. The more we fail, the more likely we are to call out for that savior. So what are we left with? Does the strategy work? Well, yes and no. The application of the law doesn't work, at all. Those who are oppressed perform significantly worse than they do otherwise. The law, remember, was brought in so that the trespass might increase. But for the Christian? The law works, absolutely. Paul again: "Therefore no one will be declared righteous in God’s sight by the works of the law; rather, through the law we become conscious of our sin" (Romans 3:20). We think that the law will coax life out of sickness, or a made jumper out of Andrea Bargnani. It doesn't work, but it will kill. The law's true work is to destroy, to remind us of our failure. Thank God we have a savior, the Christ who brings life out of death. I wonder what would happen if Raptors fans cheered Andrea Bargnani when he came into the game, as our God cheers us who are covered by Christ's righteousness. It'd be something to see.